I was extremely fortunate and surprised to get an Amazon Kindle as a graduation gift. Apparently after you’ve earned an undergraduate degree, people assume you can read! 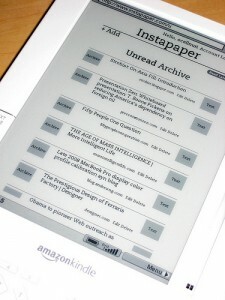 It dawned on me that Instapaper would be a perfect application for the Kindle. The Kindle’s screen is a complete pleasure to read on for extended periods of time, unlike the small iPhone screen. Also, the free EVDO data connection lets it take advantage of web services anywhere you can get a Sprint signal. I did a quick Google search to see what I could find about Instapaper on the Kindle and came across a great blog post on spontaneousderivation.com. If you leave the Kindle’s browser in standard mode, you can take advantage of Instapaper’s great mobile device interface, with simple text formatting and quick loading. However, if you set the Kindle browser into the advanced mode, you get an extremely nicely formatted Instapaper index page. Clicking on the “text” link in Instapaper for an article delivers a fast and clean copy of the web article. It really is a perfect match. Even more exciting, the developer of Instapaper, Marco Arment, has plans to further optimize Instapaper for the Kindle once he can get his hands on one himself. I’m looking forward to it. I hope this helps any Kindle owners wondering how to best read web content through the Kindle’s slow and limited web browser. Kindle doesn’t use Verizon. It uses Sprint.